There’s no telling when it will finally come. These things are hard to predict. But a special moment awaits us. 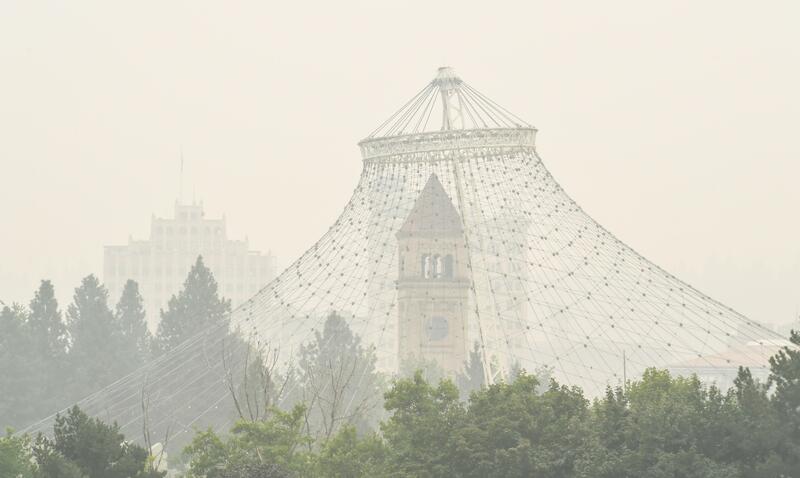 Eventually the Inland Northwest’s air will clear and the siege of smoke will be over. Really and truly over. Until the next time. It will be a revelation. It will bring the gift of clean, invisible air. When that happens, when blue skies reappear, Spokane will sigh with relief. Just imagine. Not everybody cares when local sports teams win. Not everybody votes for triumphant political candidates. But we all breathe, or at least try to. And when we can once again fill our lungs without anxiety, the celebration will be on. Dancing and show tunes come to mind. Or maybe something more subtle. No more being hyper-aware of your own respiration and wondering how much particulate matter you are sucking in with your self-consciously shallow breaths. No more need to imagine that if you keep your breathing slow and calm you’ll be OK. Someday soon, a righteous wind’s gonna blow our troubles away. Now there are two schools of thought about whether Spokane is a friendly place. Some say of course, it is. Others assert that we don’t always welcome strangers. But on the day when the smoke retreats, smiles won’t be hard to find. Oh, I guess there’s the possibility that some of us will ho-hum the return of a non-apocalyptic atmosphere. Some will complain that what we experienced is the new normal. Still, I’m guessing a few of us will feel like bursting into song. OK, there probably won’t be sailors kissing nurses along the lines of that famous war-is-over photo. But I just know Spokane is on its way to being Happytown, USA. Assuming we all survive Smokefest ’18. Sure, you might be cranky and fed up right now. But better days are coming. Right? Do you remember the Ice Storm in November of 1996? Shortly after power was finally restored to the apartment complex where my wife and I lived, I encountered a co-worker who also resided in that same Browne’s Addition complex. We weren’t friends or anything like it. But we greeted the good news by enthusiastically shaking hands. I predict that’s how it will be all over our area when the air clears. A shared misery followed by a collective sense of relief can be bonding. So how will we harness this exultant moment, when it comes? Experience a few minutes of giddiness and then resume taking clean air for granted? But you know how during the warmhearted insanity of the holiday season you occasionally feel an impulse to patch up strained relationships or mend rifts with individuals you ordinarily disdain? Sure. Well, maybe the return of breathable air will usher in similar feelings. There’s a scene near of end of the 1987 movie “Babette’s Feast” where a handful of taciturn Scandinavian villagers have been so uplifted by a transcendent meal that they begin freely confessing the many ways they had wronged one another over the years. Perhaps a similar moment is in our near future. Or maybe a wave of mood-altering fresh air will be a catalyst of another sort. Sadie the farm dog has so much personality that she once wagged her heavy tail with such unrestrained vigor that she sprained it. I now understand this is not all that uncommon, but I had not heard of it. Perhaps you have. She recovered and is back wagging again. But the thing Sadie does that I had not observed in 63 years of monitoring canine behavior is this: She chomps wasps. At least she tries to. I was having lunch outdoors with some friends. Wasps were buzzing us. Sadie, the most heroic of hostesses, began attempting to bite the wasps in midair. Her teeth made a loud clicking sound as her jaw snapped shut. I think she actually got one. Her owner said he doesn’t know how she manages to avoid getting stung. Maybe the element of surprise has something to do with it. Published: Aug. 21, 2018, 5 a.m.